There are new updates that have been added to the bottom of this story…. With issues and issues all around, to buy or not to buy a Pixel phone asks my inner sound. Resting the poet aside and getting back to business, what’s with Pixel phones and their inseparable love for bugs? Yes, you guessed it right, we have a new one today. And this time, a feature as basic as answering calls has been rendered useless. While Pixel 2’s incoming call screen wake up glitch got fixed recently, a new and equally serious issue has now come to light, and is reportedly plaguing first gen Pixels – the devices don’t ring on incoming calls. Kudos to Android 8.1 update. This problem is serious and needs to be fixed by Google at the earliest. I am missing important calls on my Pixel XL since the Android Oreo8.1 . I do not here the notification ring. I have tried all the things suggested above.I cannot keep restarting the phone every time. A patch needs to be released immediately. What is the use of a phone if a basic call functionality does not work. After upgrading to 8.1 Oreo, I have an intermittent issue of no sound during incoming call or notification. I’ve been missing important calls because of this and isn’t this basic functionality?Have gone through similar threads and saw a default reply from folks asking to boot into safe mode and factory reset.I haven’t bought this Pixel XL for such a cozy price to do all this non sense every now and then there is a dirty update breaking things more than fixing bugs. Earlier in December I’ve spent whole lot of time identifying battery drain issue and had to manually turn Optimize toggle for all apps that are yet to be optimized to Oreo. Now within a month, I’m hit with basic issue of notifications. But how can I be doing and I can not afford to miss important calls. I am having the same issue…..and it started happening after the 8.1.0 upgrade. I am not sure what triggers it, but suspect either the phone going into the silent profile and not coming out of it, even when increasing volume, OR connecting back and forth on Bluetooth. 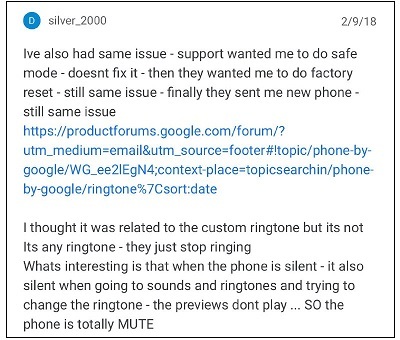 Phone restart helps, until the problem gets triggered again, which probably is one of the causes above…..
Interestingly some of the affected users also note that the ringtones on their units somehow get reset to ‘None’ and options gray out (as can be seen in the following user shared image ), which in turn results in no ringtone/sound on incoming calls. @madebygoogle I got a faulty google pixel no sound on calls etc (known fault) EE won’t repair it who do I contact ? It’s in warranty..
@Google has there been any complaints about original pixel having issue not hearing incoming calls. The ringtone is all the way up. I have done a factory reset and still problem exist. Nice, I have a @VerizonWireless phone that decides several times a day that it doesn't want to ring for incoming calls. Since this is a business phone this is not acceptable to me. Same thing happened to me upon upgrading to 8.1 If I reboot it solves it for a little, but shortly afterwards no notification sounds again. Happening to me as well, specifically for text notifications. Sometimes the sound is triggered, sometimes it isn’t. Sadly, for some of those who received RMAs or refurbished devices, the new units were no different. I have this issue on my pixel XL. Will not ring most of the time do I’m missing phone calls. I returned my phone to Verizon and they sent a factory refurbished replacement. I couldn’t download my back up into the replacement phone until I updated to 8.1. Now the replacement phone has started doing the same. It will ring door some calls them quit. If I restart the phone it will ring again for a while then stop again. I spent an entire day on the phone with Google and Verizon have got no where! I have tried resetting Blue tooth, I have uninstalled apps. I have talked to google all they want me to do is factory reset the phone which I refuse to do. 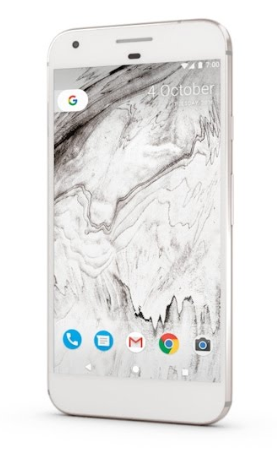 This is my second Google Pixel XL (first Gen) Both have had the same problem so it is not the hardware. they had me go back to an older version of the phone app, that didn’t help. I am at a lost. when my phone is not ringing it wont make sound on my car speaker either. There seems to be no rhyme or reason to what is causing the issue. when I reboot my phone it will start ringing again but the first few phone calls it wont recognize the contacts in my In my phone. So it will just display the phone number but not the person calling. I am confused as to why GOOGLE is not working on this issue. I was just instructed to not let my phone do automatic updates. Well that keeps it from having further issues but does not fix the issue at hand. I should have went with a different brand! We have passed this to the development team and will update this issue with more information as it becomes available. While Google is yet to acknowledge the issue officially, we hope they do it sooner as it’s already troubling hundreds of users. We are keeping a close watch on all related developments and will update as and when anything newsworthy comes up. This issue has been officially fixed by Google. For more details, head here.